Successfully Added Pen Camera (8GB) to your Shopping Cart. 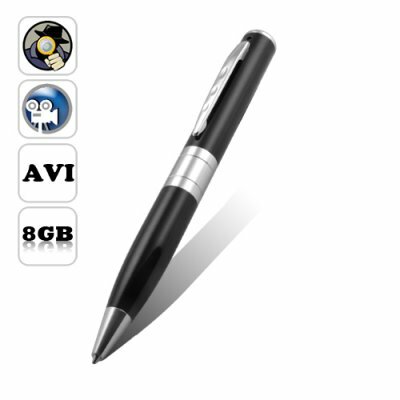 The i75 Pen Camera is a fine writing instrument with a high definition camcorder and digital still camera hidden inside. Place it in your shirt pocket or place it on the table in front of you to capture people in the act. You can even use it as a life blogging device! The possibilities are endless... And it comes with a free 8GB TF / microSD card! Great Pen: If you're into fine pens then you'll recognize brand name pen makers like Parker, Waterman, or even Montblanc. Continuing in that tradition of writing excellence is the i75 Pen Camera that writes as smooth as it makes videos. In fact, when you start using this black ink filled fine writing instrument and experience its flowing cursive elegance, you'll probably want to begin that novel you've always wanted to write. Not only is this fine pen a pen camera, its an amazing pen camera! Captured videos are extraordinarily vivid and bright. Videos are accompanied by HIFI audio and are saved as 30 frames per second AVI files! It even comes with a FREE 8GB TF/microSD card. Truly the i75 Pen Camera is one hot gadget! Buy some today and we'll express ship it out tomorrow. Brought to you by the leaders in online direct from China wholesale electronics and dropshipping - Chinavasion. Real pen you can write with! Comes with 8GB TF / microSD card free! Takes high resolution photos as well! Comes with everything you need so you can start using this pen camera right out of the box! 8GB memory is able to store over 4 hours of high quality video! How do you take pictures on this Pen? When the unit is on (green light on), just press the button and it takes a picture. Hold the button and it takes video. Be serious. You're claiming that this pen writes as well as a Parker or a Montblanc pen even though it costs 1/10th the price? Check out this article on Instructables. [http://www.instructables.com/id/Save-$200-in-2-minutes-and-have-the-worlds-best- wr/]. Basically an expensive pen is only expensive because of its brand name. A good pen however is good because of the ink refill inside which is fairly inexpensive. So yeah, we're not kidding when we say this pen writes as well as the expensive ones. It works fine, but the instruction manual is awfully written, in the worst possible english. I just received this item very good video and good audio. If you are in the market, this seems to be winner. on 2011-03-05 05:27:44 Well DONE !!! Even the picture quality is not too good, but the Videos Quality is AWESOME !!! Nice piece of TECHNOLOGY !!! Whatever I may order for my customers, in each order they wish this spy gadget. I can guess why! Because of the romantic hue from the spy short stories about secret agents of the epoch of 60ths and 70ths. In spite of my offers to purchase more serious items, they have ever chosen THE SPY PEN CAM!